By default, customer settings are inherited from the global settings, however each customer may be configured to override these defaults. These instructions provide a walkthrough of why and how to change customer-specific settings. Configure optional overrides for a customer for Store Front (1), Shipping Group (2) and Payment Options (3). 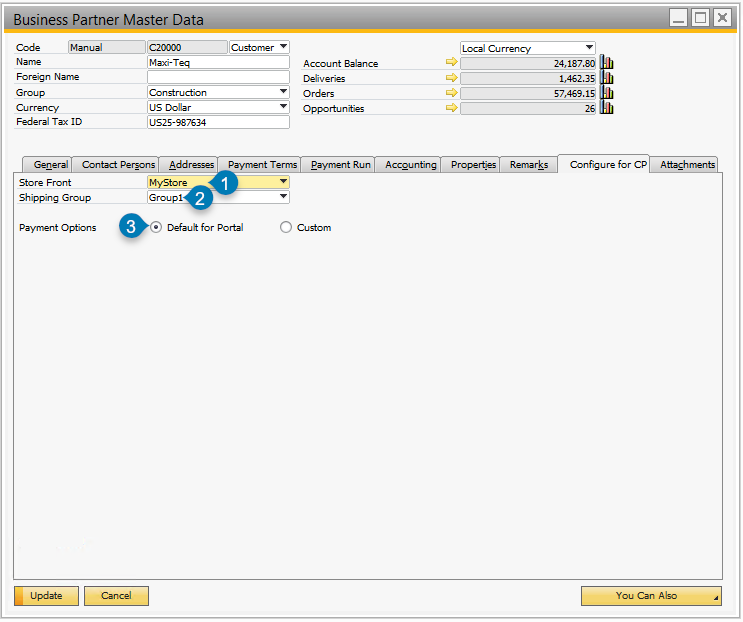 In SAP Business One, go to: Business Partners > Business Partner Master Data > Configure for CP tab. Optionally set the Store Front to provide the customer with a specific layout. Alternative Store Fronts provide unique shopping experiences that may be appropriate for high-volume customers. Optionally override the Shipping Group to provide them with alternative shipping options. For example, you might set up a shipping group for high-volume customers who get a shipping discount, or who see special options (such as “Free”) not available to all customers. Optionally override the Payment Options to allow this customer to see additional payment options, or to restrict the customer to specific payment options. For example, customers who have poor repayment history may be restricted to only allow Credit Card payments, while preferred customers may be enabled for On Account payments.